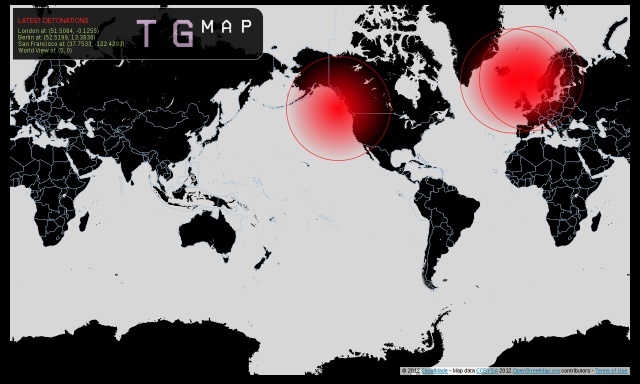 The volatility of information in networked, digital contexts frames a precedent for clamouring (and often unrealistic) attempts to contain it. This increasingly influences how we use networks and think about the right to information itself; today we see the fear of the leak actively exploited by law makers to afford organisations greater opacity and thus control.. This anxiety, this 'network insecurity', impacts not just upon the freedom of speech but the felt instinct to speak at all. It would now seem letting public know what's going on inside a publicly funded organisation is somehow to do 'wrong' -Bradley Manning a sacrificial lamb to that effect.. Meanwhile, civil servants and publicly-owned companies continue to make decisions behind guarded doors that impact the lives of many, often leaving us feeling powerless to effect change, both in and out of a democratic context. 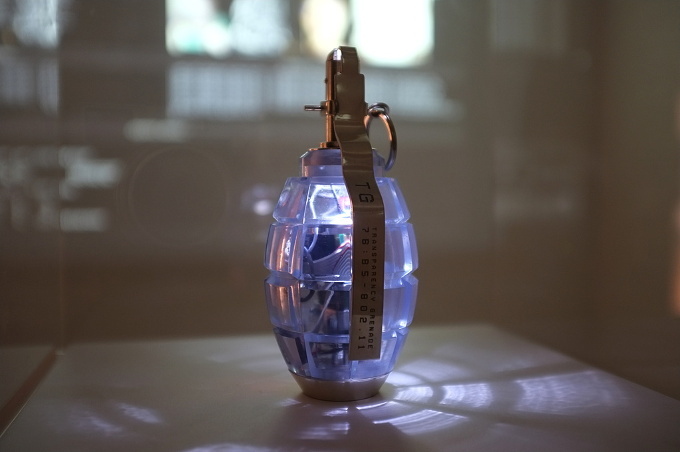 The Transparency Grenade seeks to capture these important tensions in an iconic, hand-held package while simultaneously opening up a conversation about just how much implicit trust we place in network infrastructure; infrastructure that reaches ever more deeply into our lives. 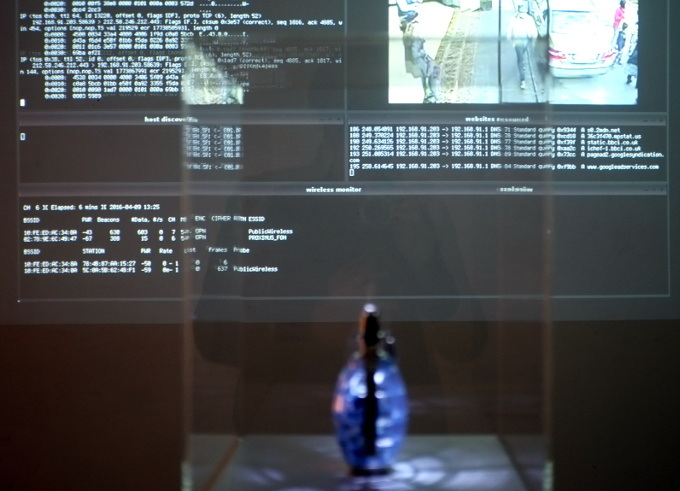 This is a one-off object created in January 2012 by Julian Oliver for the Studio Weise7 exhibition at Labor 8, Haus der Kulturen der Welt, Berlin, curated by Transmediale 2012 Director, Kristoffer Gansing. 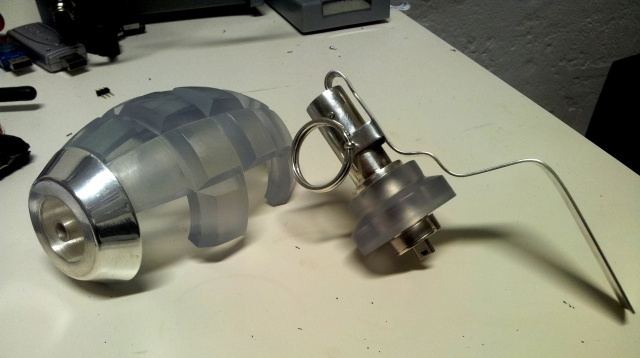 The body is made of Tusk2700T, a highly resilient translucent resin, printed from a stereo-lithography model made by CAD designer Ralph Witthuhn based on a replica Soviet F1 Hand Grenade. 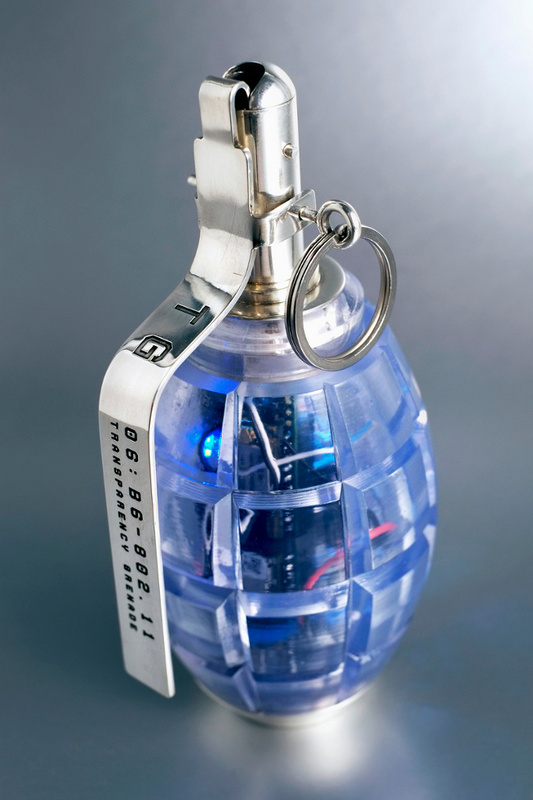 Metal parts were hand-crafted from 925/1000 sterling silver by Susanne Stauch, complete with operational trigger mechanism, screw-on locking caps and engraving. 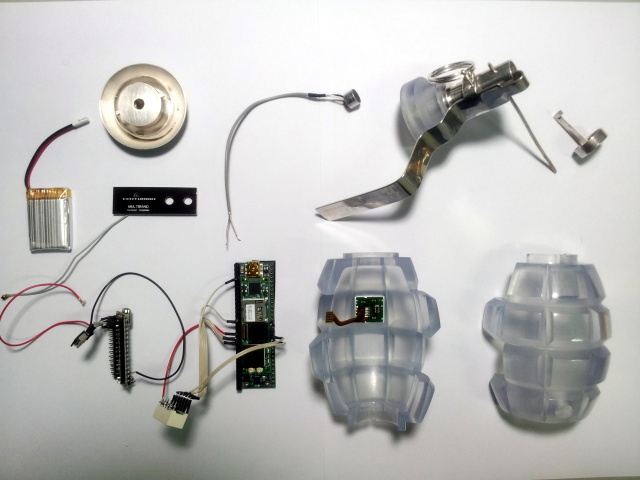 STL files for the Grenade body are available here, licensed under CC-BY-SA. 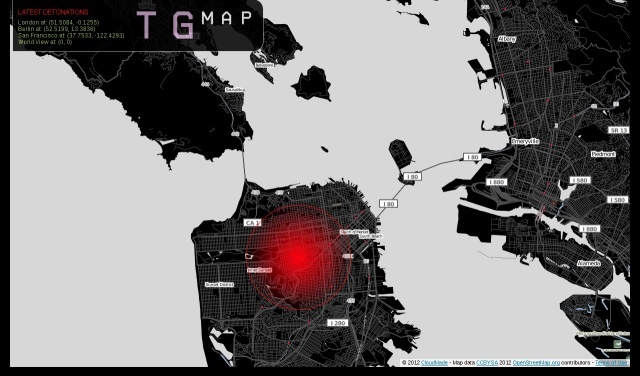 The components include a 'Gumstix' ARM Cortex-A8 computer with expansion board, Arduino Nano (for SPI display control), LED Bargraph (for wireless signal level, controlled by GPIO pin outs from Overo COM), powerful 802.11 board antenna, 3.7v battery, 64x32 pixel LCD RGB display (harvested from NKK 'SmartSwitch), 5mm cardioid microphone and an 8Gb MicroSD card. The computer runs a modified Angstrom OS, a GNU/Linux embedded operating system popular on ARM devices. 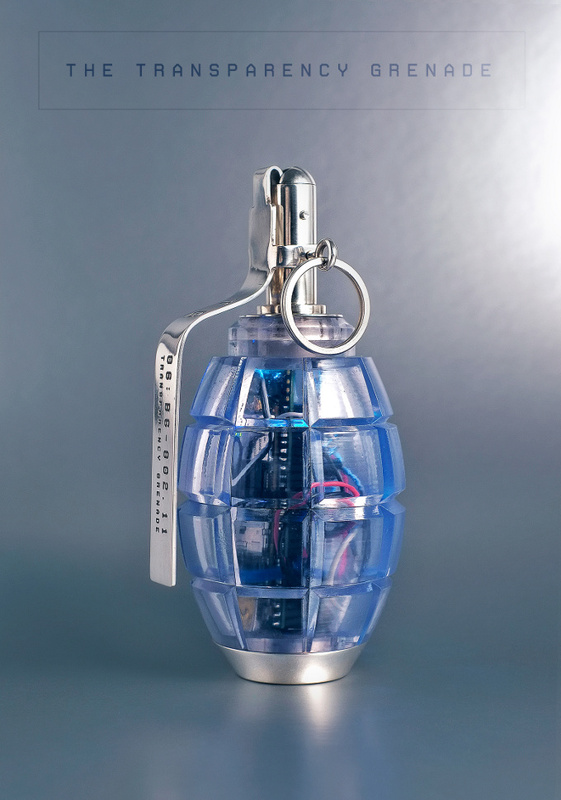 Any work done on the software side of the Transparency Grenade was done on a laptop running Debian Stable. Programming was done using the IDE VIM. Minicom was used for serial communications using a USB Serial FTDI from Sparkfun electronics. 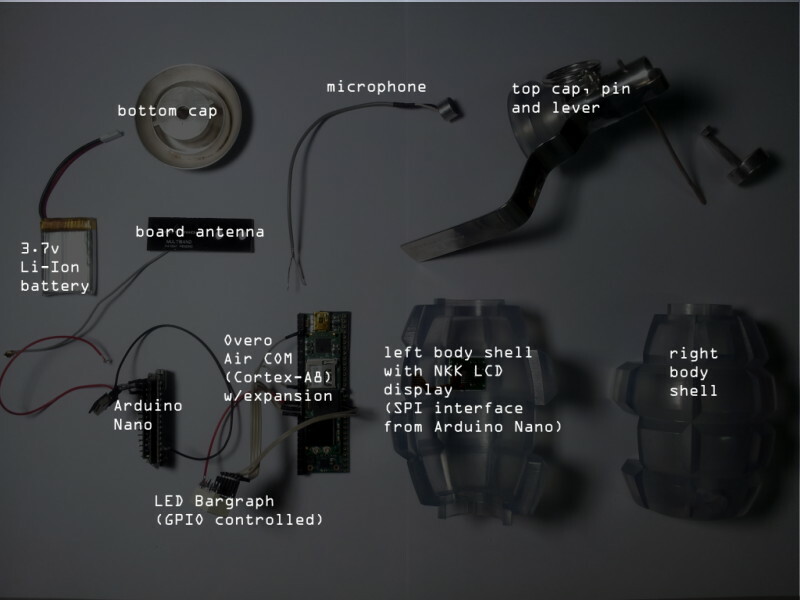 The grenade itself has no other software related to the capture part running on-board.